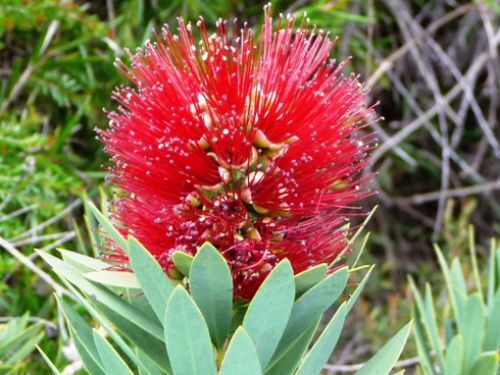 Callistemon ‘Little John’ is an attractive dwarf, rounded shrub that reaches a height of one metre by one metre wide. The narrow leaves are an unusual blue-green and crowed along the stems. Flower spikes are dark red and about five centimetres long by the same width. Flowering is prolific in spring and in our cold climate garden plants also bloom in autumn and winter. Honeyeaters visit the flowers. Growth habit, foliage and flowers are attractive features. To keep plants bushy and blooming bounteously remove the spent brushes. Callistemon ‘Little John’ may have been selected from a batch of Callistemon viminalis seedlings. The cultivar was raised by Ken Dunstan in northern NSW and was shrub of the year in 1986.